Taylors Crossing in Copper Mountain Colorado Real Estate is located in center village, moments from the base of the ski area. With less than a 100 yard walk to the slopes condos at Taylors Crossing are a great option for the ski/snowboard enthusiast. Built in 1999, there are 50 condos in Taylors Crossing comprised of 2 – studios, 22 – one bedrooms, 21 – two bedrooms and 5 – three bedroom residences. The condos range in size from 411 – 1279 square feet. With four levels in the building views will vary from ski area views, lake or SKY Chute views or even Ten Mile Creek views depending on which side of the building the Taylors Crossing condo is located. 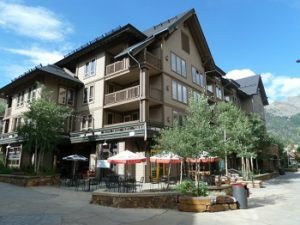 Each condo for sale in Copper Mountain CO Real Estate that is located in Taylors Crossing has access to many amenities. The amenities include a spacious lobby, fitness room, hot tub, steam room, sauna and private ski lockers. There is also an elevator on site with access to the covered garage for parking and additional storage for bikes and such. Being located in Center Village in Copper Mountain like Taylors Crossing is, provides the owner and guests direct access to fine and casual dining, bars/lounges, shops and everything you could want in Copper Mountain Colorado. There is a 1.5% transfer tax, monthy homeowners dues and resort/neighborhood fees associated with purchasing a condo in Taylors Crossing. The dues do include everything you would need besides internet and phone. Taylors Crossing homeowner association dues vary by unit size but include heat, electric, water/sewer, cable, snow removal and trash pickup. When considering condos for sale in Copper Mountain CO Real Estate take a look at Taylors Crossing and other condos in Copper Mountains Center Village. These are some of the best condos in Copper Mountain.